that I'm with child? It's true. Baby #2 is on the way! Most of you probably already know this fun development, but I felt the need to officially put it out there in the blog-o-sphere. We just went yesterday for our 17 week appointment. I can't believe how fast this pregnancy is going so far. At this rate, we'll be a two-child household in no time. Scary. Exciting. Scary. Some of you might remember the life-changing all-day-long-and-most-of-the-night-sickness that I had with baby #1, aka Riley. Well, this time the sick came earlier, around week 7. And left much, much earlier too, around week 10. Thank you, thank you. It was intense while it lasted, but I can't tell you how happy I was --am-- was that it was easier than pregnancy #1. Oh. My. I guess every pregnancy really is different? Other that that, smooth sailing. 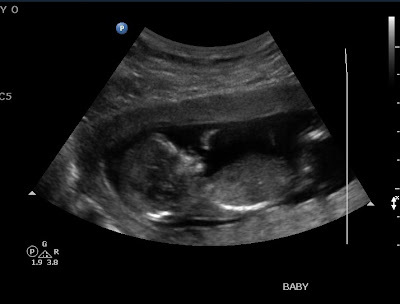 We've had some cool diagnostic ultrasounds to test for Downs, etc. and all have come back negative. Blessed, indeed. We are measuring a sweet-sounding week ahead and our official due date is September 22. Two weeks from yesterday, we will know whether our wiggle bean is a boy or a girl.